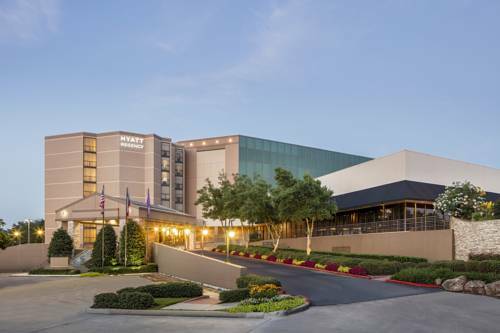 The Hyatt Regency Houston North offers every traveler a dedication to service, quality, and convenience. Guests are welcomed into the lobby with a soaring sunroof atrium and a floating walkway. The hotel is eight stories and features 335 oversize guestrooms including one Junior suite and two Presidential suites. Guests can choose from an atrium or outside view, designated quiet zones and room types of one king bed or two double beds. Business and leisure guests will appreciate complimentary airport shuttle service to and from Bush Intercontinental (IAH), a smoke-free environment, complimentary wireless internet in lobby and guestrooms, access to the business center, a 1,600 square foot fitness center, and an outdoor tropical pool with cascading waterfalls and a hot tub. Whether you are in the mood for a hearty breakfast, lunch or a romantic dinner, Sams Restaurant delivers. Relax and unwind after a long day at Sams Restaurant which offers Texas-sized refreshments, large screen televisions, regular happy hours and more. Planning a meeting or event has never been easier as the Hyatt Houston North offers 27,000 square feet of meeting space all on two levels. Changes to the dates of stay, number of guests per room or number of rooms confirmed will be subject to current pricing which may be different than previously confirmed rates. Cancel by 3PM CST 24 hours prior to arrival. Sam's Restaurant and Bar offers breakfast, lunch and dinner. The menu features American cuisine with a South Texas flair.